The 5 in 1 cooker that thinks for itself!!! 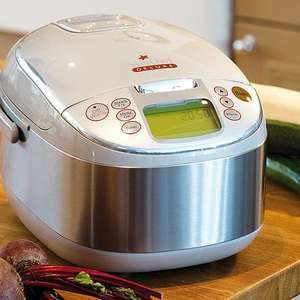 Whether you want to cook perfect rice, slow cook a casserole, steam vegetables or make porridge, Star Chef Deluxe 5 in1 cooker lets you do it all - even cook rice and steam vegetables at the same time. Using infrared ceramics technology, it’s designed with maximum heat distribution for optimum cooking. Its large capacity non-stick bowl can cope with big portions, while the steaming and slow cooking timers make organising meals super-easy. Slow cooking really brings out the flavours in your food without overcooking or burning. Paellas, goulash, chillis, rice puddings, curries, risottos – Star Chef delivers perfect results for so many classic, comforting recipes. Steam fish and chicken for low calorie, healthy dinners. Put dough in the Star Chef and you can even enjoy freshly baked homemade bread and cakes. All modes offer an automatic keep-warm function, meaning you can keep dishes warm and moist up to 24 hours after cooking. The electronic LCD digital display makes it easy to choose and select the mode and time you need. Includes measuring cup, spatula with detachable holder clip, rice paddle, steaming basket, power cord, instructions manual and recipe book. Yeah it looks similar, like a Hyundai looks like a Ferrari. It might be great but 2.8 litre seems a quite small capacity to me. I cook rice with a regular pan all the time, no idea why one would require a £50 product to do the same thing? hi, It doesnt just cook rice!!.............. You should read up on the product it slow cooks,steams,braises etc. If you direct to JML at the moment they have a promotion running leaving a total of £51.50 including delivery which normally cost £6. Bargain.